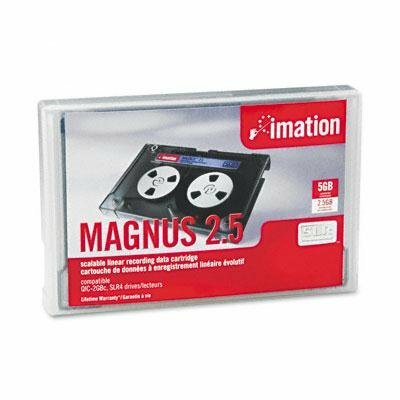 This is an Imation Magnus data cartridge which is compatible with QIC-2000C tape drives. It offers a 2.5GB native capacity and Black Watch backcoating for better reliability. It has a patented no end play hub design for improved data integrity, a continuously-molded corner roller that provides consistent drive force and creates less noise, and a one-piece tape guide that improves tracking. Its patented Dura-Stat drive roller dissipates static and extends cartridge life. This Imation Magnus cartridge also features a textured drive belt for high speed, high density recording, a stippled baseplate that allows for accurate tape positioning and tracking, and a thermally stable cover and baseplate that reduce warping for better tracking and more reliable read/write operation. Imation 1/4" 2.5GB/5GB DATA CARTRIDGE Imation P/N: 51111 46168 For SLR4 Series Drives.